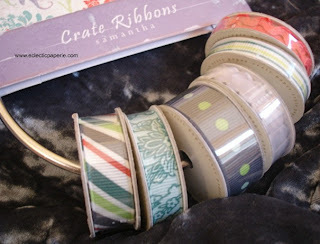 Just had to show you these pretty new and fun ribbons from Crate Paper. There are 5 different ones that coordinate with the newest 5 Crate Paper lines. The jpgs we have up on the store site don't show you how really pretty these ribbons are. Plus, you do receive 6 spools and not the 5 shown on the jpg. 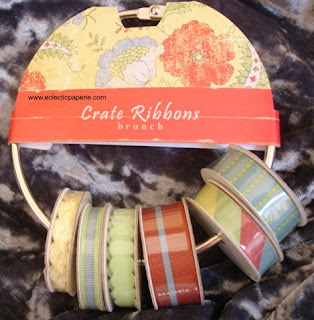 Each ribbon assortment comes with 1-yd ric rac; 1-yd velvet trim; and 4 patterned 1-yd grosgrain ribbons. They all come on this "ginormas" ring for cute packaging and portability.